In previous years, thesis carrels have for the most part been picked by the students themselves. This year that system is getting overhauled, in favor of a randomized assignment system that is designed to be less time-consuming for staff and more fair to students. However, this change has received mixed reactions among students. In previous years thesis carrels have been assigned from a list of eight, or more. possible thesis carrels which the students would come up with and turn into the library staff, who would then assigned thesis carrels according to preference. This year, however, the carrels are being assigned to students using a random number generator style of assignment in order of students who signed up for carrels, with the only preference being given to students who have signed up to share the carrels. 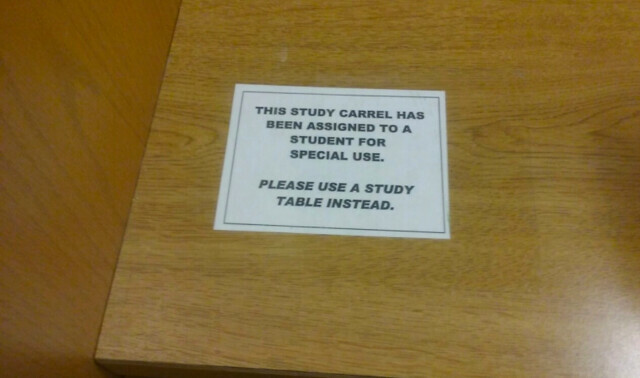 So – theoretically – a student who has yet to sign up for a thesis carrel could still get one of the best carrels. This system also provides a fair assignment system to University of South Florida (USF) graduate and honor students, of whom half of the thesis carrels have to at least be offered, because half of the library technically belongs to them, despite not being on their campus. In an email interview thesis student Hannah Coker, despite her issues with the new system, realized that assigning thesis carrels in any way that was at all helpful would be a lot of work for the library staff. “I feel like the application could have taken into account student preferences— ‘Would you prefer a grouped carrel or an isolated one?’ or something of that ilk. I think it would be cool if they asked about our thesis topic and assigned carrels close to shelves with relevant topics, but obviously, that would be a logistical nightmare. As it is, I’m sure randomly assigning carrels makes it a ton easier for library staff, so I can’t really complain,” Coker said. While students are upset at the new system for its lack of taking into account student preference, according to Sofia Eury a second-year student, and the Library Representative for the New College Student Alliance (NCSA), the New College who plans to be a librarian one day, the new system was actually a lot of little changes that have been put into place at once for the convenience of the library staff. And, might actually benefit the students in the long run. Eury begins by explaining that New College students tend to become attached to New College at varying degrees which can be a challenging bond to disconnect from moving further into the student’s life. A phenomenon which she calls the New College bubble. The library staff has also realized that this is a problem, when, in the past students have lined up outside of the library before it even opened and ended up in tears because they didn’t get a certain thesis carrel. The staff has decided to try and ease students out of the New College bubble by removing the thesis carrels that students have tended to use as sort of a blanket during their stressful thesis year. Allison Piper, the Associate Dean, said that the New College bubble while being the main reason that the change to the system was made, is not the only reason. The change was also made to be beneficial to library staff, in terms of time, and to be fair to USF students who New College students share the library with. “It takes a lot of time at the beginning of the year, for staff, and that’s a tough time because staff are dealing with getting books on reserve, buying books, or getting books that faculty needs, like books that don’t come into the bookstore or are expensive we try to buy, we don’t buy textbooks but we buy other books for classes and some of that happens at the last minute, like when books turn out not to be available to students in other ways. So there’s a lot that is happening, plus doing a lot of borrowing, interlibrary borrowing, particularly for thesis students, but also for others who are already getting going on a project as well. So to have somebody stand and go over a long list of people and assign people to what carrel they want wasn’t a really good use of staff time as we are trying to serve faculty and students and get going with the semester,” Alison explained that the system was also changed in order to save time in an especially busy time at the beginning of the school year. Students who did not get a thesis carrel still have a change, however, the thesis carrel assignment system is split into three parts, with the second round set to end on Oct. 24, where all students can then apply for a carrel with the buddy priority in effect for three days. Other questions or concerns with the thesis carrel assignment system can be directed towards Alison in an email at apiper@ncf.edu, or at (941) – 487 – 4409. 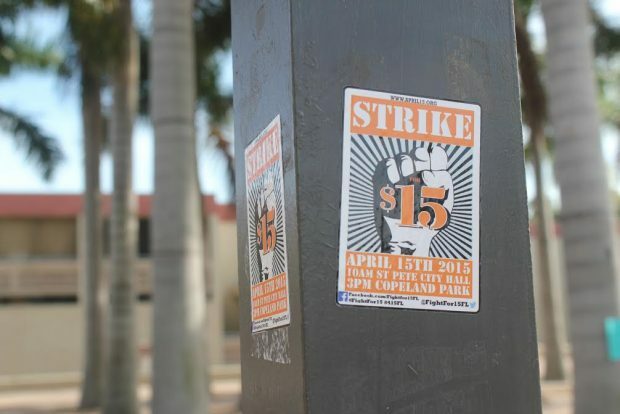 Fight for $15: Economic insanity or moral imperative?